Home >Comments and Articles > Faith Healer? Fraud! A local television current affairs program ran a story recently about a Brazilian faith healer named John of God. Actually, two competing programs ran stories about this charlatan on different channels. I was interviewed for one of the shows, at very short notice. I was first contacted at about 3:30 when I was with a client and the interview was recorded between 4:30 and 5:00 for a show going to air at 6:30, so I had no time to collect any relevant material to show the reporter. What I heard was enough, however, to tell me that we were looking at fraud, because all the signs were there. The one puzzling matter was that there was a woman claiming that this man had cured her lung cancer, and she had before and after x-rays to prove it. The "evidence" for the cure was the collection of before and after x-rays of the woman's cancer. What I saw on TV suggested that a) the x-rays were of different parts of the body and b) they were taken with different settings of the imaging equipment. The letter from the radiologist about the "after" shot talks about "skeletal metastases", but she is supposed to have had lung cancer. Comments from three doctors follow. 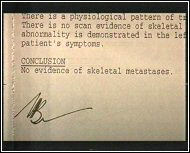 It is obviously impossible to make a diagnosis based on what was available, but diagnosis was not what was required. What was wanted was opinion about whether these images provided any evidence at all of a cured lung cancer. The interesting part was that all the doctors agreed that the "before" scans were not of a lung at all, but showed a liver. The xrays are uninterpretable. The first few are CT scans of liver containing a lesion of uncertain nature. The last is a single cut of a thoracic scan, and is meaningless without the original for comparison. You are quite right, the before images are ct scans of a liver, the "after" is a chest. The third doctor requested a second opinion from a friend. 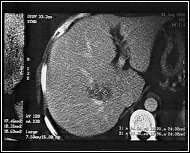 X-ray 2,3,4 - fairly low-quality CT scan of liver showing a cystic, possibly multiloculated, lesion in the liver - there are many non-cancer causes of liver cysts (more than cancer-related causes) such as bacterial infection, congenital cyst, and amebic (or amoebic) cyst. X-ray(?) 5 - A fragment of the radiologist's report on what appears to be a bone scan (based on fragment - "physiologic pattern of tr[acer uptake]", which is fairly standard "boilerplate" text on that sort of report). The absence of bony metastases does not equal freedom from cancer; some cancers do not metastasize to bone. Also, what kind of cancer was she diagnosed with? That would help a lot. X-ray 6 - Fairly low-quality CT scan of chest below the heart - no gross abnormalities visible on web view. 1. Did she actually have "cancer" or was she suffering from some sort of non-malignant process (which might be expected to spontaneously resolve). Even experienced radiologists and oncologists can be fooled if they are only going on a CT scan. Did she have a biopsy? 2. Films 2, 3, and 4 appear to be from the same scan - the lesion does not change significantly between them. Film 6 appears to have the same quality as the others and may also be from the same scan. 3. No date is visible on the radiologist's report - it would be routine procedure (in the US) to get a bone scan at the time of initial diagnosis to see if the cancer has metastasized, so this may also be from about the same time as films 1 - 4. 4. 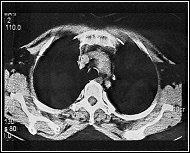 The putative "after" film does not prove anything other than the cancer had not metastasized to that part of the lung (a slice about 1 - 2 cm thick). It is by no means a "proof of cure". I would be much more interested to see the parts of the scan which include the liver, since that was the site (presumably) of the original cancer. BTW, if it was an infectious process (bacteria, ameba or amoeba), there should be a residual scar visible on CT scan. This scam is not new. One thing the reporter mentioned to me was that the "healer" pushed a table knife into people's eyes. As soon as I heard this I knew we we looking at a retread of the story told by James Randi in his 1982 book . The picture at the right is taken from the book and shows Randi pushing a knife into his eye in the manner employed by a conman named Arigo. The whole healing act performed by John of God is just what Randi was describing more than twenty years ago. The new version even boasts, as did Arigo, that he uses unsterilised instruments. My initial impression when I was first approached was that the woman might have had cancer and was falsely attributing a miracle cure to the faith healer when it was really due to conventional treatment or even remission, although the probability of that is remote. I now think that she was simply lying and is part of the promotion for the scam. 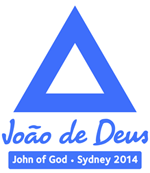 At least one of the Australians supposedly "healed" by John of God is openly promoting tours to Brazil. These people are just as disgusting as the charlatans who pretend to perform the miracles. They steal money from desperate people and dress it up as religion so that any criticism can be seen to be an attack on faith. The only thing these people have faith in is money. You can see an article promoting this fraud here. In November 2014 my hometown is to receive a visit from a lying, thieving, charlatan. For a price of just $295 per day (plus $14.53 booking fee) or $795 plus $25.85 for the full three days, desperate people with illnesses will be lied to by someone who claims to be a healer. This particular scamster goes by the name "John of God". And how do I know that he is a lying, thieving, charlatan you ask. Because he has been pulling this scam in Brazil for more than a decade, but even then he was recycling a scam which was going on at least twenty years before that. I first came across him in 2003 when his promoters were using x-rays to prove that he could cure cancer when even the most cursory examination of the x-rays showed that there was no evidence there at all. It's simply a fraud, designed to steal money from people who are desperate. The normal way that he conducts his scam is to apply hands-on healing, including all the old faith healer tricks like pulling chicken gizzards out of folds in people's bodies. I'm not sure how he intends to do this in a venue which seats about 6,000 people, but I suppose he will just do what other faith healers do, which is have a few people on stage and do tricks with them and make occasional announcements that people in the audience being cured of diseases like diabetes. In a sense faith healers like John of God are worse than even the worst of the cancer quacks, because everything is pushed back onto the sick person. If the person doesn't get better it is not the fault of the curer, it is the fault of the patient for not having enough faith. What is particularly annoying about this money gouging trip to Sydney is the publicity that it has been given by major media outlets. Two of the leading newspapers in Australia have weekend supplement magazines and because they are magazines they are not subject to the deadlines and time limits of the news sections of the papers. Journalists writing for these magazines have time to research the stories and find out the facts. On Saturday, October 3, both of these magazines carried uncritical, laudatory stories about John of God. Much of the information was provided by a hotel in Brazil. One of John's claims is that he treats people for free, but if tradition is being observed either he or his family own the accommodation that victims stay in and the pharmacies from which they buy the medications that he prescribes. The journalists apparently didn't notice, or didn't care, that there was a massive conflict of interest in receiving information about the scam from an active participant and beneficiary. It was surely a remarkable coincidence that your article about the faith-healing fraud should appear on the eleventh anniversary of something I wrote about him. what are you saying, that we timed the story to somehow coincide with a web post that you put up 11 years ago? The only conclusions I can draw from this reply is that the journalist in question is either too dense to understand English or he simply doesn't care about whether what he writes is correct or not. The fraud being perpetrated by John of God is so transparent that is almost impossible to think that any responsible journalist being asked to write a story about it could not see what is happening but would instead present a story that makes it appear that there is not even an iota of doubt about legitimacy. I headed my original article about this "Faith healer? Fraud!". Nothing I have seen in the last eleven years suggests that I might have been even slightly incorrect.